September 13, 2012 - The International Air Transport Association (IATA) called on the governments of Kazakhstan, Central Asia and the Caucasus to utilize air transport as a catalyst for economic growth and development. “Kazakhstan sits at the crossroads of East and West. And with double-digit growth in air traffic demand across the whole of Central Asia and the Caucasus it is an emerging success story—a Silk Road in the Sky" said Tony Tyler, IATA’s Director General and CEO. Tyler made his remarks in a keynote address to the Central Asia and Caucasus Aviation Day being held in Astana, Kazakhstan. Tyler highlighted the need to improve safety in the region. In 2011 the air transport industry recorded one accident for every 2.7 million flights using Western-built jet aircraft. In the Commonwealth of Independent States (CIS), there was one accident for every 940,000 flights—three times worse than the global average. Growth in connectivity is in danger of being compromised by airport infrastructure that is comparatively expensive and not keeping pace with demand growth. “The plans for a new terminal at Almaty airport in Kazakhstan are welcome, but the capacity increase lags the growth projections. We need to think strategically to ensure that economic opportunities are not artificially constrained by lack of infrastructure,” said Tyler. IATA is partnering with the Kazakhstan Ministry of Transport and Communications to ensure that airline requirements are met as it attempts to ensure that 15 of the country’s 20 airports comply with ICAO requirements by 2020. IATA announced the establishment of its first office in Central Asia and the Caucasus. Attached to the IATA European regional office in Madrid, an IATA presence has been established in Astana. 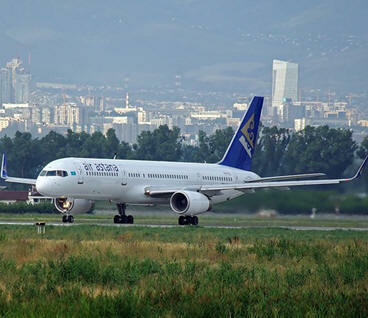 The development of air connectivity has been a key contributor to Kazakhstan’s phenomenal economic success, and air travel in Kazakhstan grew by 22% in 2011 (compared to 2010). “For the landlocked expanse of Central Asia, at the crossroad of some of the world’s greatest markets, the potential for aviation to drive economic growth and development is almost without limit. IATA is committed to working alongside all stakeholders in Central Asia and the Caucasus for the safe, efficient and sustainable development of air transport,” said Tyler.